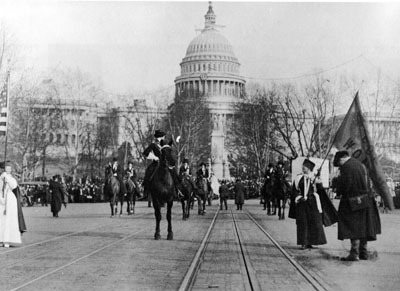 A scene from the 1913 March for Suffrage in Washington, about to turn onto Pennsylvania Avenue, led by Jane Burleson, with a sign stating a demand for a federal suffrage amendment. Friends, readers, countrypeople, meet one of the greatest alumnae in the American history pantheon. Our own beautiful revolutionary, Alice Paul, Class of 1905, was far ahead of her time—and President Woodrow Wilson—a century ago. Their clash over “Votes for Women,” her thoroughly modern seven-year campaign, was bitter and personal. By the time Paul burnt Wilson’s speeches in a “Watchfire Protest,” the president and the suffragist had met several times and could not stand each other. She gave him no peace even in wartime. Enlarging American democracy has never been easy. The right to vote was never “given” to women; it was hard won in 1920. Paul, founder of the National Woman’s Party, led the movement to victory with the passage of the 19th Amendment. What made all the difference? Taking suffrage outside—to the streets of Washington in a visible, ongoing display of vigils, protests, arrests, and other civil disobedience. “Alice Paul put suffrage back on the national stage,” says Elspeth Kursh, the collections and facilities manager at the Sewall-Belmont House and Museum. Two blocks from the Capitol stands the spacious brick house where Paul lived and built the 20th-century women’s suffrage movement. “She understood it was a great moment of change, and real change is only achieved by the party in power,” Kursh adds as she leads visitors through the elegant rooms and up the staircase of the 1799 mansion. A century ago, women streamed in and out, some staying a while as organizers for the cause; it was a perfect base camp for a long climb. Telegrams were the latest technology, which Paul issued with Twitter-like urgency. 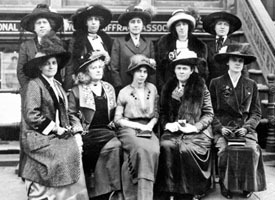 : A National Women’s Party meeting with Alice Paul, center. Courtesy of the National Woman’s Party Collection, The Sewall-Belmont House and Museum. In 1913, the spirited young Quaker woman organized a massive demonstration. The languishing women’s rights movement, divided for decades and weakened by Susan B. Anthony’s death in 1907, needed fresh blood and a new strategy. Fresh from standing shoulder to shoulder with London’s militant street suffragettes, Emmeline and Christabel Pankhurst, the 28-year-old Paul was the woman of the hour. A cultural Southerner born before the Civil War, President Wilson never caught up to Paul, an avant-garde Quaker from New Jersey. Arriving in Union Station as president-elect March 3, 1913, to be sworn in the next day, a surprised Wilson demanded to know why there wasn’t a crowd of well-wishers to greet him. The answer: “Everyone’s watching the Woman Suffrage Parade, sir.” To be sure, the parade was a harbinger of progress. Wilson, a proud Princeton man, was not amused. Even as a Progressive politician, he was no friend to human rights at home. Paul’s grand suffrage parade on Constitution and Pennsylvania avenues was just her way of saying hello, with brilliant timing, sending a public signal that suffrage was, well, cool. As historian Jean H. Baker has noted, Paul was the first leader of a mass movement to focus on only one person, the president. With single-minded intensity, Paul never let Wilson forget suffrage for a day—even the day before he started the job. Somehow in only three months, Paul, Lucy Burns, and a small army mobilized at least 5,000 women to march in the parade, the likes of which Washington had never seen. From the National Woman’s Party headquarters, her home base, Paul’s team sent word across the land to come and gather for a grand spectacle. Like Henry V’s Battle of Agincourt, you’d be sorry if you weren’t there. As the presidential guard changed, a new era and star were born in the suffrage movement. With Paul taking the torch at the same moment as Wilson, the movement was more daring, defiant, and exhilarated. Paul’s charisma drew a whole wave of young college-educated women into the ranks. In fact, at the parade, she marched with a contingent of Swarthmore friends. Thousands of women wore white dresses on the streets. One rode a white horse. Purple was the other color of the day. Flowers made for picturesque scenes. The notable Helen Keller came to the march, as did Nellie Bly. Then the lines of women were attacked by a mob of men, hurling bricks and stones right under policemen’s noses. The police joined in the riot, attacking the suffrage marchers, 100 of whom were hospitalized. And the cavalry was (literally) called out by Bainbridge Colby, later Wilson’s secretary of state, to protect parade marchers from further harm. So it was not all bread and roses. Violence done by a city police force underlined what Paul well knew: Don’t depend on male authority to “give” women anything except a hard shove. The movement would no longer politely petition for suffrage rights. Instead, women would make more scenes in public. They chained themselves to the White House gates. As America prepared to enter World War I, suffrage signs mocked the Wilsonian idea of making the world safe for democracy when women were awaiting liberty. In inclement weather, Wilson at times invited them in for tea and a lecture, but these sessions did not go well. Ladies who stepped out of their place were not his cup of tea. From an old-line Quaker family, Paul knew all about nonviolent resistance—Quakers practically invented it when the English crown harassed them, and they practiced it as abolitionists hiding fugitive slaves in their homes. Many people think Quakers are timid in the face of confrontation. On the contrary, they are often creative in conflict and brave enough to be jailed for their beliefs. Paul was first jailed in London; stateside, she and others in the suffrage sisterhood were placed in a squalid Virginia detention facility in Occoquan. Once women were force-fed to end a hunger strike, public sympathy swept to their cause. Somebody’s mother, somebody’s wife, or somebody’s sister was being brutally hurt. That was the beginning of the end of the suffrage campaign. Wilson at last surrendered as public opinion and congressional support mounted, state by state, in favor of the rallying cry: “Votes for Women!” The wartime effort also helped women win the day. 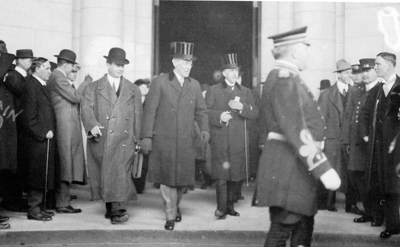 President Wilson leaves Union Station on his way to inauguration in 1913, which had to compete for an audience with the Suffrage parade. This major figure in our College’s history is too little known, though there is a Swarthmore residence hall and an HBO movie in her honor. As a history major, I never heard a word about her in class. 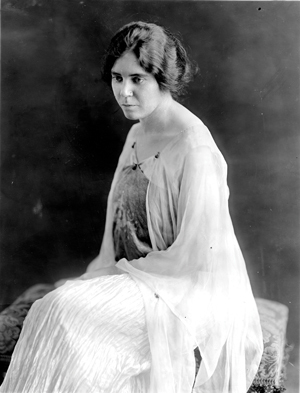 To wit, did you know Alice Paul authored the Equal Rights Amendment? She named it for Lucretia Mott, a famous Quaker founder of the College. A leading anti-slavery light, Mott founded the American women’s rights movement in 1848, and Paul carried on her unfinished work. It’s no accident that these champions of justice were Quakers, raised to speak out ever since they were schoolgirls. Generations apart, they each brought their inner light to the public square, where women had no voice and no vote. In 1920, Alice Paul was just warming up: “It is incredible to me that women should consider the fight for full equality won. It has just begun. … Unless women are prepared to fight politically they must be content to be ignored politically.” The rest of her life, into her 80s and 90s, she campaigned for passage of the ERA, which fell just short in the 1970s. She died just before it failed in a few state legislatures. It will never be given to women. They will have to win it. Her Quaker identity and lifelong quest for justice aptly fit the Quaker expression: “Let your life speak.” Alice Paul’s speaks resoundingly to this day. Jamie Stiehm ’82 is a Creators Syndicate columnist covering politics, history, and culture. She lives in Washington, D.C.